Infosys Limited, the IT major, has an IT office campus at Mahindra City, Chennai, India. The first office building on the campus was built about 10 years ago. Office buildings have been added progressively over the years and the capacity of the existing chilled water plant had been exhausted. 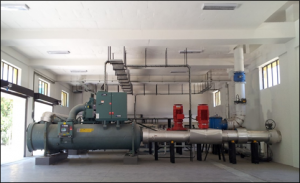 We were engaged to design a new, high efficiency chilled water plant to augment the existing chiller plant and cater to the future demand. The challenge was to design a plant room that would be the most energy efficient for the given weather conditions and also serve as a model for future plant rooms in Infosys.